From 1971 forward, Ritchie Blackmore not only used the mid-rangy sounding Hornby-Skewes trebleboosters, he also used the highly dynamical and brilliant sounding CM booster, built and designed by Bill Hough. 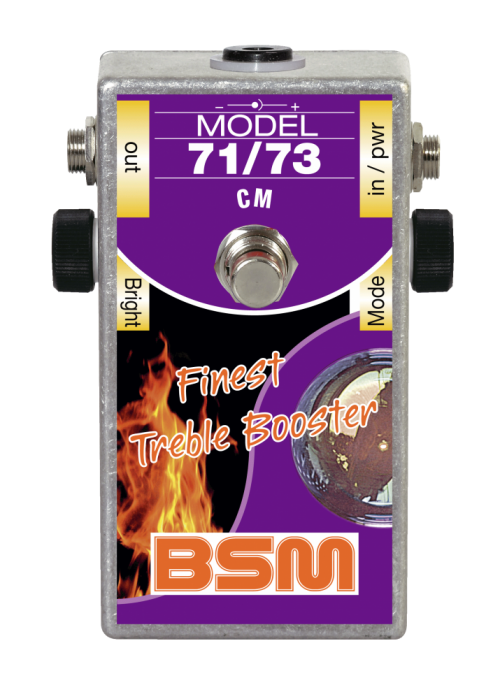 For all historical details look H E R E The new BSM 71/73 CM is a faithful recreation of this pedal plus the typical BSM add-ons. This is all you need to cover the whole tonal range of the legendary Deep Purple Mk2 period. The "Mode" and "Bright" controls make this low-gain stompbox extremely versatile, producing a classical Hardrock tone with a lot of nuances. Not only useful for Blackmore-sounds this is a pedal that also works well with humbucking pickups, giving you a crisp yet dirty crunch sound on an already overdriven tube amp. You will even get a super-clean funky tone with single coils and a clean amp. You will probably never want to switch off this pedal anymore. The 71/73 CM Booster should be inserted between guitar and amplifier, not into the FX loop. The magical tone is achieved by the interaction between guitar pickup, booster and amplifier. The unit is powered by a 9V battery with a current consumption of approx. 280uA. The average output level is 5dBm, the maximum output voltage when the strings are struck really hard is 5V max.The unit is true bypass and can be powered by 9V battery or the external 2.1mm DC power-jack. The box can even be powered up to 18 volts for increased headroom and maximum dynamics. If you have any questions concerning our products, especially the BSM 71/73 CM Treble Booster, our tech-head and mastermind Mr. Bernd C. Meiser would be happy to talk to you. So don't hestitate any longer and send him an email to info@treblebooster.net or use the contact form to contact him.